A scale architectural model is an important component to any large-scale development project such as office and municipal buildings, hospitals, housing developments and apartment complexes. An architectural model allows the architect, developer, investors, builders, city council members and anyone else involved in the project to share a common vision. It is also an excellent marketing tool; a way to seek investors and future tenants and for public relations and media. With a physical model, you can better visualize the building to gain a perspective that can’t be achieved with drawings or 3D renderings. You can visualize the position of the building on the property to see how it fits in with surrounding buildings and to optimize sunlight, views and landscaping. With 3D printing technology, we can create highly-detailed, full-color and monochrome models. The architectural model of this office building was created using binder jetting technology on the Projet 660. The model took up nearly the entire build envelope on the 660. The material is sandstone-like and has a slightly textured finish. The 3D-printed model is a traditional office building with five stories and features a window column in the center and one on each corner. There are also solar panels on the top for green energy. 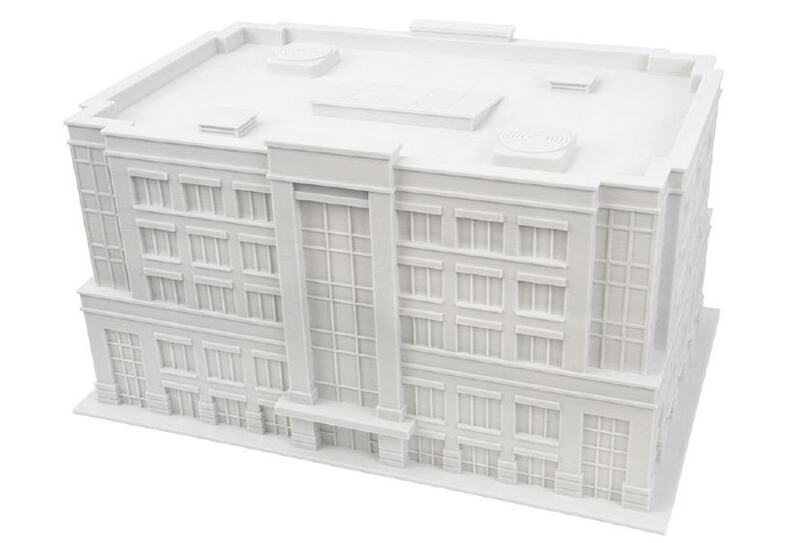 Click here for more information about 3D printing architectural models. Other Notes: The model was designed in five hours.